Hunter-gatherers living in Europe during the transition from the late Pleistocene to the Holocene intensified food acquisition by broadening the range of resources exploited to include marine taxa. However, little is known on the nature of this dietary change in the Mediterranean Basin. A key area to investigate this issue is the archipelago of the Ègadi Islands, most of which were connected to Sicily until the early Holocene. The site of Grotta d’Oriente, on the present-day island of Favignana, was occupied by hunter-gatherers when Postglacial environmental changes were taking place (14,000-7,500 cal BP). Here we present the results of AMS radiocarbon dating, palaeogenetic and isotopic analyses undertaken on skeletal remains of the humans buried at Grotta d’Oriente. Analyses of the mitochondrial hypervariable first region of individual Oriente B, which belongs to the HV-1 haplogroup, suggest for the first time on genetic grounds that humans living in Sicily during the early Holocene could have originated from groups that migrated from the Italian Peninsula around the Last Glacial Maximum. Carbon and nitrogen isotope analyses show that the Upper Palaeolithic and Mesolithic hunter-gatherers of Favignana consumed almost exclusively protein from terrestrial game and that there was only a slight increase in marine food consumption from the late Pleistocene to the early Holocene. This dietary change was similar in scale to that at sites on mainland Sicily and in the rest of the Mediterranean, suggesting that the hunter-gatherers of Grotta d’Oriente did not modify their subsistence strategies specifically to adapt to the progressive isolation of Favignana. The limited development of technologies for intensively exploiting marine resources was probably a consequence both of Mediterranean oligotrophy and of the small effective population size of these increasingly isolated human groups, which made innovation less likely and prevented transmission of fitness-enhancing adaptations. Location of Upper Palaeolithic and Mesolithic sites on the Ègadi Islands and in NW Sicily. 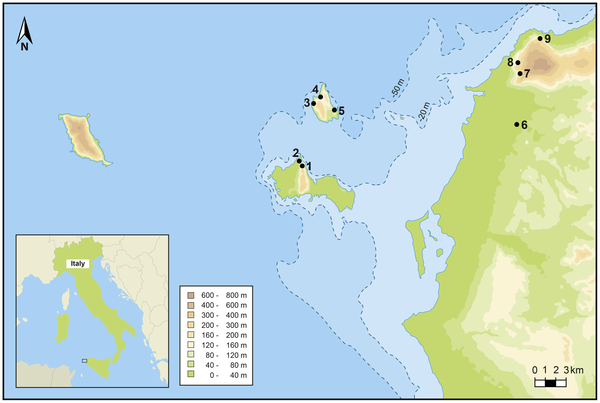 These cave sites include: Grotta d’Oriente (1) and Grotta dell’Ucceria (2) on the island of Favignana; Grotta di Punta Capperi (3), Grotta di Cala dei Genovesi (3), Grotta Schiacciata (4) and Grotta di Cala Calcara (5) on the island of Levanzo; Grotta Maiorana (6), Riparo San Francesco (7), Grotta Martogna (8), Grotta Emiliana (9) and Grotta Maltese (9) on the mainland of Sicily. No late Pleistocene or early Holocene site has been discovered on the westernmost island of the archipelago, Marettimo, and on the two islets of Maraone and Formica, between Levanzo and the mainland. Taking into account that the coast of NW Sicily has been tectonically stable during the period in question and using the sea level curve published by Lambeck et al. , it can be hypothesized that Levanzo became an island sometime between 9,000 and 8,500 cal. BP (as modelled by Mannino et al. ), while Favignana was fully isolated around 7,000 calibrated years BP and was a peninsula for part of the early Holocene. The later Mesolithic hunter-gatherer (Oriente X), whose remains have been recovered at Grotta d’Oriente, lived at a time (ca. 9,500 cal. BP) when the sea level was around −41 m. At this time the shoreline was somewhere between the −50 m and −20 m bathymetry contour lines and Levanzo was probably a small peninsula.